Hundreds of years after the invention of the kite, flying is easier than ever with this casting rod. According to folklore, an ancient Chinese farmer tied his hat to a string so he wouldn't lose it, but when the wind kicked up, the hat swirled and pierced the sky like it was alive. That beauty inspired the first kite. 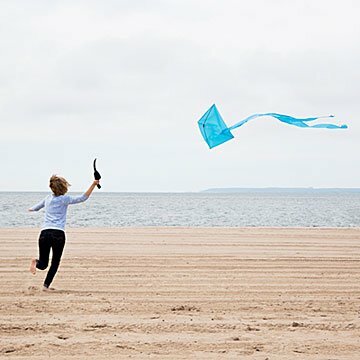 Hundreds of years later, this re-imagined version lets kids as young as four cast their kite without the complications of conventional lines and spools. Flyers keep their back to the wind, press a lever to release the spool, and draw it back in with a reel. The dazzling design is put together in Pawling, New York, halfway across the world from where that first kite was created. Includes blue kite and a carrying case. He'll love this and hopefully think of his Mom every time he fly's it! This product makes it easy for even the youngest child to fly a kite successfully! Great gift for kids of all ages.